Watching NBS TV’s Joy Doreen Biira’s well manicured fingers sweep and caress the ground as she played Duulu (think of pool without the cue sticks, fancy balls or table) with the big boys at Kati Kati was a marvel.Never mind that the game was stationed right at the entrance because it had the only dirt patch. 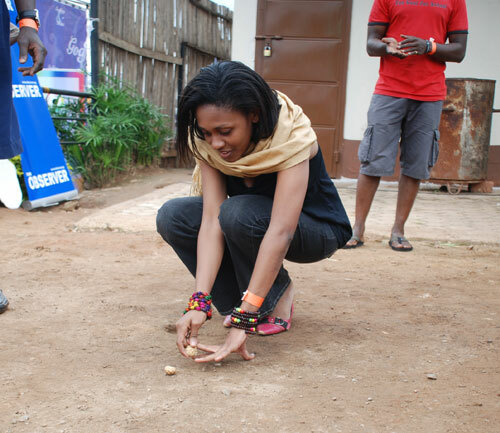 Biira was so into the game, shooting those marbles expertly with her fingers. She beat off the boys and played to the finals. And yet that was just one of the highlights that marked the 360 Network Old Skool reunion last Saturday. School uniforms, dodge ball skills, all came out as the corporates headed for Kati Kati to link up with the child inside each of us. 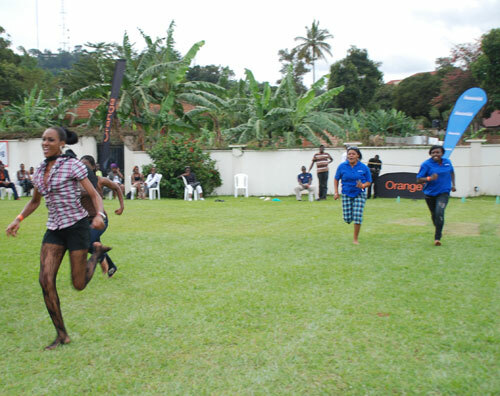 At stake were nostalgic games like busu, kwepena, ‘mummy and daddy’, duulu, hopscotch, tyre race (kibbobbo) and sack race. Even the football was played old skool; no fancy balls, but one made out of banana fibre. There were dormitories, prep, mansters (sic! ), head girl, and tough prefects handing out cards to wear for ‘students’ caught speaking vernacular on the ‘campus’. And what is old skool reunion without those famous love letters with dedications, ‘tic tac it to’, ‘penning off’ and flowery writing pads? How about the slang, ‘give me a push’, ‘banging a buffalo’ and ‘that chick is fly’? Defining what Old Skool is for this event meant choosing between the 60s style of afro wigs, bell-bottom trousers and Gabon shoes for some, and back to school uniform for others. Red Pepper’s Ben Byarabaha was awarded the best dressed; he and his three-year-old son wore identical uniforms – checked green and white shirt with badge, khaki shorts and school socks. They were quite a sight, the older Byarabaha drinking his break-time ‘juice’ from a green bottle, while his classmate’s juice looked orange. Ah, the juice that those ‘mother dorms’ were dishing out at break and lunch time! The Observer’s Pius Muteekani Katunzi must have overdosed on the ‘juice’; he could not keep a straight line, let alone balance an egg on a spoon during play time. As for Carolyne Nakazibwe, the tug of war brought back the kid in her. Not only did she jump up high when the game was announced, she pulled the rope with so much gusto that it snapped into two and emcee Roger Mugisha declared, “It is a draw”. But Yours Truly was a complete star, winning the girls’ tyre race. Miss Uganda Sylvia Namutebi got down and dirty, throwing off her shoes to run in the 100m girls race. By the way, she won all her races. She was not shy to take part in the debate and have the audience judge her level of intelligence. Truth be told, she is quite something beyond the beauty. The school debate’s motion was ‘Water is better than fire’. Is there a school in Uganda that did not debate this motion back in the day? There were proposers, and opposers who gave preambles, debated primary school style, observed protocol, banged tables and reminded us of the famous line, “Is it in order for the precurrent speaker…” Remember that one? The audience was quick to call onto the chairman, Red Pepper’s Arinaitwe Rugyendo, for point of information, point of inquiry. The icing on the cake was the mosquito-no-pass ‘squeeze’. The way the boys made their way to the shy, finger-biting girls to ask for the dance! The anxiety that left many back in the day sweating plasma during the dance, as boys worked their hands down the girls’ bums during school dances, was recreated. And as school traditions go, there was a blackout as the dance ensued, drawing excited squeals from the dance floor. Just the stuff nostalgia is made of. 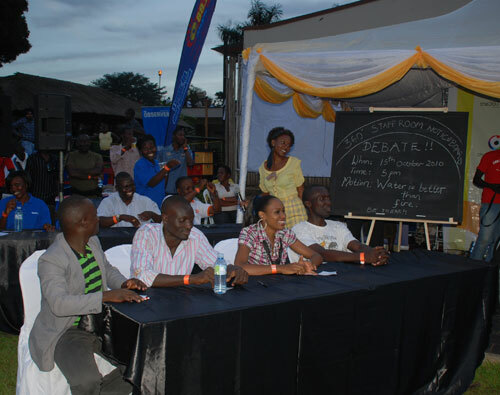 The whole event was a success not only because of the sponsors The Observer, Red Pepper, Orange Telecom, Sanyu FM, NBS TV, CEO magazine, SMS Media, and Oxford Digital Media, but also because of one man’s sharp memory and energy – Roger Mugisha, the timekeeper and emcee. He not only remembered every game down to the last detail, but also knew every school slang, slogan, phrase, teachers’ nicknames and school schedules. I wonder where he gets his energy; must be all that ‘juice’ he was drinking. Winners of different games walked away with mobile phones, T-shirts, tyre covers, airtime and one participant took home a Samsung Galaxy Tab from Orange Telecom.